Thinking of selling your medical device in China? 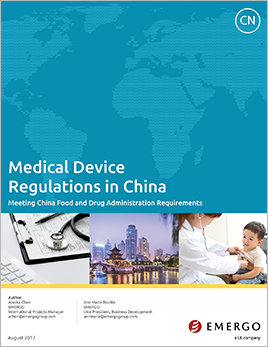 If so, you need to register your device with China's regulatory authority, the China Food and Drug Administration (CFDA), now the National Medical Products Administration or NMPA. The NMPA has strict regulatory requirements, especially for foreign manufacturers who want to import their products to China. It's important to understand the requirements before you begin the registration process. You'll learn all this and more in this 8-page white paper.